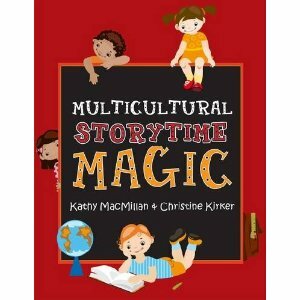 In Kathy MacMillan’s and Christine Kirker’s new book Multicultural Storytime Magic, the authors encouragelibrarians to include cultural diversity in their library storytimes. The premise of their book is that multicultural elements should be included in every storytime, not just special storytimes that occur around cultural holidays. MacMillan and Kirker are no strangers to library storytimes. They are also the authors of Storytime Magic (ALA, 2009) and Kindergarten Magic (ALA, 2012). MacMillan and Kirker start out Multicultural Storytime Magic with a short introduction that presents facts and figures on cultural diversity in the United States. After the introduction, the book is broken down into 44 chapters, with each chapter about a common storytime theme. The themes are listed in alphabetical order, and include fun themes such as “Bedtime,” “Forest Animals,” “Shoes,” and “Winter.” For each theme, there are multicultural book suggestions, flannelboard stories, fingerplays and songs, and crafts. The flannelboard patterns, craft patterns, and worksheets, which are shown in miniature in the book, are available in full size on the ALA Editions website. The only thing that would enhance the book’s content is pictures of the finished craft projects. The stories, activities, and songs in the book represent many countries and cultures throughout the world. For example, there is a flannelboard version of “The Seven Chinese Brothers” in the “Brothers and Sisters” chapter, and there is a song called “My Boat is Going” from Lebanon in the “Transportation” chapter. Many of the themes include Spanish language or American Sign Language elements. One of the book’s greatest strengths is its organization. The 44 chapters are easy to follow, and there are three appendices and an index of names and titles. Appendix A: Culture Notes and Index of Entries by Culture is especially useful when looking for materials on a specific culture. Also, materials and activities that are suitable for two- and three-year-olds are marked with an asterisk. This is a useful feature because libraries offer a variety of storytimes for different ages and the asterisks allows librarians to quickly see which materials are appropriate for the younger age group. The content, organization, and resources included in Multicultural Storytime Magic make it a useful tool for youth services librarians in public libraries or school librarians who serve preschoolers and kindergarteners. It will help librarians incorporate multicultural touches into their regular storytimes or put together an entire storytime dedicated to a specific culture or country. Highly recommended. Erica Littlefield is the Youth Services Department Head at Twin Falls Public Library. A native Idahoan, Erica recently completed her MLIS degree online as part of the SWIM Cohort through the University of North Texas.